Tempil® Tempilstick® temperature indicators are an accurate, inexpesive way to prevent weld cracking from improper pre-heating or post-heating of weldments. Tempilsticks® let you know when exact surface temperatures are reached without electronics, gauges or the need for calibration. Each Tempilstick is made in the USA and is NIST traceable. Indviual temperature ratings are available from 100 degrees F to 2,000 degrees F.
Accurate - results are +/- 1% of rated temperature. Easy to use - melts at designated temperature for easy visual inspection. Reliable - always in calibration. Superior quality - free of contaminants such as sulfur, lead and halogens. Outlasts - designed to be stronger and last longer than other brands. Precise - unique slip-resistant metal holder secures stick and maximizes control. Efficient - fast results reduce set up and down time. Compliant - meets AWS D1.1, ASME Code Sec. I, III and VIII, ANSI/ASME Code B31.1 and B31.3. are these a paint or wax? do you have an how to use? 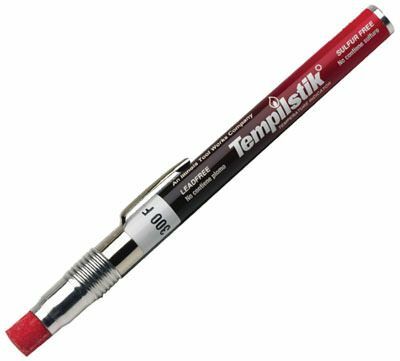 The Tempilstik Temp Indicator is marketed as a "crayon like marker"- although it is not wax or paint. When it is in a solid form it is more of a wax like crayon consistency but once it reaches the melting temperature it becomes a paint like liquid consistency. I want tempilstick 316 c and 288 c do you have in stock and can you ship fast to UK? very unclear about how to designate the desired temperature and order it easily; instead they just sent the lowest rating temperature, which is basically useless to me. partly my fault, partly the description fault. It is exactly what I ordered, great price, and the shipment was quick. I would definitely order from Cyberweld again.